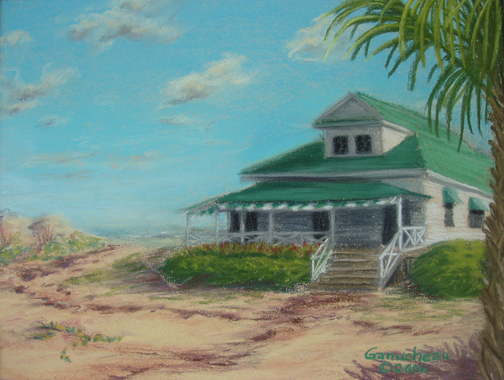 Pastel pleine-aire painting of the Myers Cottage which houses the Wrightsville Beach Museum, NC, by Rose Ganucheau. Collection of the artist. 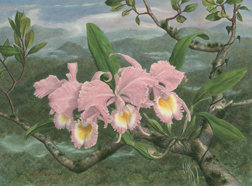 Giclee´prints available below. Painted in the early afternoon at the Wrightsville Beach History Museum. The cool green roof and shady wrap-around porch of the historic Myers Cottage invite visitors to "put their feet up and set a while". Although moved from its original site, I decided to put it back where it belongs next to the ocean nestled in the dunes. From here you can hear the waves crashing and smell the salt air as you sit on the porch shelling butter-beans for supper. Now available as a Full-Size Limited-Edition Giclee' Print. Edition Size 100 prints.